We hope this section helps answer a few of the questions you may have. If you have a question not covered in this section, or if you would like more information, please call Witmer Heights 213-482-9122. We look forward to hearing from you! 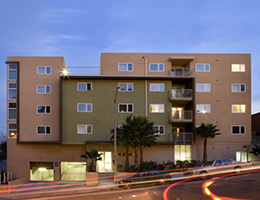 What type of housing is Witmer Heights? Is it low income housing? Witmer Heights is a tax credit community for families. Rent is based on area median income and is set below a specific level relevant to the community. Monthly rental of the apartment, water, and trash service. Yes, there is a one-year lease, but we understand the necessity of unanticipated move-outs. Witmer Heights has 49 apartments. 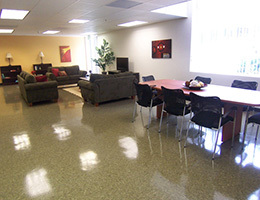 Witmer Heights offers spacious one, two, and three bedroom apartments, as well as a few more accessible apartments for the sensory/mobility impaired. How do I get started with the move in process? Simply fill out an application completely, sign it, and mail it to the address on the back of the application. Yes, currently Witmer Heights has a waiting list. Please call for the approximate waiting time. The Security Deposit is the same as one month’s rent. Witmer Heights does not allow pets. There is no additional storage available; however, each style of apartment offers a large amount of storage space. 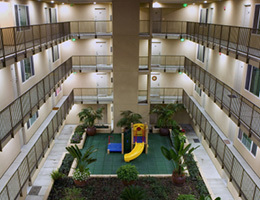 Yes, there in one elevator located in the center of the building, easily accessible by all residents on all floors. Yes, Witmer Heights offers its residents the use of one parking lot, with additional on-street parking in the front of the building. How many keys do I receive? Residents receive an apartment key, a key to a locked mailbox for their apartment, and an access key to the main entry. Our main entrances are intercom controlled and automatically open with the key. There is one laundry room at Witmer Heights. It contains coin operated washers and dryers. There is a garbage center on each floor of the building specifically for garbage/recycling purposes. Inside, there is a chute to dispose of trash directly into a dumpster. There are labeled bins for all recyclables. Yes, the city of Los Angeles offers transit services, which include buses, Amtrak, and metro rail.